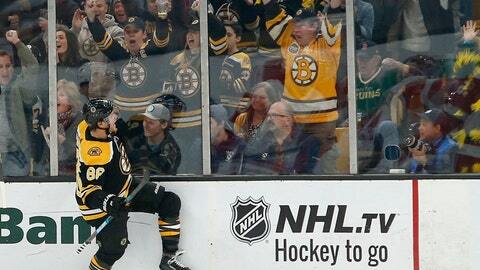 It was the second career hat trick for Pastrnak, who has scored seven times in five games this season. Filip Hronek and Dylan Larkin scored for the Red Wings, who fell to 0-5 for the first time since 1980. Jonathan Bernier had 31 saves. Detroit has lost its last 10 against Boston. PHILADELPHIA (AP) — Cody Eakin scored with 1:25 left and Marc-Andre Fleury stopped 26 shots to lead Vegas. Fleury earned his first shutout and second win of the season for the Western Conference champions. The Golden Knights had been in a bit of a sophomore slump with a 1-4 start that included an opening-night home loss to the Flyers. NEW YORK (AP) — Connor McDavid scored the go-ahead goal on the power play and added an assist, lifting Edmonton to its first win of the season. McDavid scored his second of the season at 6:23 of the third period, redirecting the puck past goaltender Henrik Lundqvist with Rangers forward Vladislav Namesnikov in the penalty box for holding. Cam Talbot made 23 saves against his former team for the Oilers. The 21-year-old McDavid, who has led the league in points each of the past two seasons, has points on all five Oilers goals in three games this season. Mika Zibanejad opened the scoring for the Rangers at 12:49 of the first period. Nugent-Hopkins tied the contest at 14:17, tapping a rebound past Lundqvist for his first this season. ST. PAUL, Minn. (AP) — Sebastian Aho scored his second goal of the game in overtime to lift Carolina. Justin Williams tied it for the Hurricanes with 1:09 left in the third period, and Carolina matched the best five-game start in franchise history by tying the 4-0-1 Hartford Whalers in 1995-96. TAMPA, Fla. (AP) — Victor Hedman, Cedric Paquette and Yanni Gourde had first-period goals, and Tampa Bay beat Columbus. Brayden Point scored in both the second and third periods, and Andrei Vasilevskiy had 30 saves for the Lightning. Alex Killorn, Nikita Kucherov and J.T. Miller also scored for Tampa Bay. The Lightning, who led the NHL in goals last season, had scored just twice over 125 minutes in their first two games. Tampa Bay was held scoreless during the final 159:27 of the 2018 Eastern Conference Final by eventual Stanley Cup champion Washington. WASHINGTON (AP) — Auston Matthews scored a goal in his sixth consecutive game to start the season, Frederick Andersen made 25 saves and Toronto beat Washington. Moments after Andersen made several solid saves to preserve the lead, Matthews provided an insurance score with his NHL-leading 10th goal with 1:39 to play. Josh Leivo scored the go-ahead goal early in the third period. Kasperi Kapanen had a goal and an assist and Par Lindholm also scored for Toronto, which has won four straight. Jake Gardiner had two assists. Matthews has scored a goal in all six games this season and has multiple points in each. He also has four assists and joined Sweeny Schriner (1944-45) as the only Maple Leafs to score a goal and have multiple points in the first six games of the season. Evgeny Kuznetsov scored his fourth goal of the season for Washington and added an assist. Chandler Stephenson also scored and Alex Ovechkin had two assists. Braden Holtby made 24 saves. SUNRISE, Fla. (AP) — Bo Horvat scored the tiebreaking goal in the third period, leading Vancouver past Florida. MONTREAL (AP) — Paul Byron and Jonathan Drouin scored in the shootout to lift Montreal past Pittsburgh. NASHVILLE, Tenn. (AP) — Filip Forsberg scored twice, Viktor Arvidsson had a goal and an assist, and Nashville beat New York for the second time in eight days. Calle Jarnkrok and Kyle Turris also scored for Nashville, which has won four of its first five games. Juuse Saros stopped 20 shots and won both games against the Islanders. The Predators jumped ahead with three goals in a 4 1/2-minute stretch late in first period. Nelson and Ladd got the Islanders within one in the second, before Nashville sealed the win in the third. DALLAS (AP) — John Klingberg scored the go-ahead goal late in the second period, when Dallas scored on four of its team-record 30 shots, and the Stars beat Anaheim. The barrage wiped out a 3-0 Anaheim lead and came against Ducks goalie John Gibson, who entered the game 3-0-1 with a 1.44 goals-against average. Anaheim’s Jacob Silfverberg and Kiefer Sherwood had first-period goals, and Adam Henrique added a power-play goal at 8:09 of the second. GLENDALE, Ariz. (AP) — Linus Ullmark stopped 36 shots for his first career shutout, and rookie Rasmus Dahlin scored his first career goal to lead Buffalo. OTTAWA, Ontario (AP) — Chris Wideman got his first two goals in nearly a year, and Craig Anderson made 36 saves to lead Ottawa. Chris Tierney, Mark Stone and Colin White also scored for the Senators, and Matt Duchene, Brady Tkachuk and Thomas Chabot each had two assists. Trevor Lewis scored for the Kings. Jack Campbell made his fourth consecutive start for Los Angeles and allowed four goals on 11 shots before being replaced by Peter Budaj. Budaj allowed one goal on 11 shots. DENVER (AP) — Elias Lindholm scored the tying goal with 1:54 left in regulation and Johnny Gaudreau won it in the first minute overtime as the Flames beat the Avalanche.